With all the magical, must-see destinations popping up around the globe, your passport has probably gotten a lot of action lately—or is about to, anyway. You can take wellness cruises that let you venture through the Mediterranean Sea with a green juice in hand, see elephants roaming in Kenya, or climb the lush hills of Bhutan. There’s one hot spot in particular that’s getting all the buzz, though, and there couldn’t be a better time to visit than now. When you think of Japan, you probably think of the hustle and bustle of big cities, like Tokyo. But along with the fast-paced environments, there’s also a stunning countryside, some of the best food in existence, and too many wellness-centric activities to count—so it’s no wonder that Japan was just named Travel + Leisure‘s 2018 Destination of the Year. The next time you’re feeling adventurous and ready to explore, keep the many reasons to visit Japan in mind. 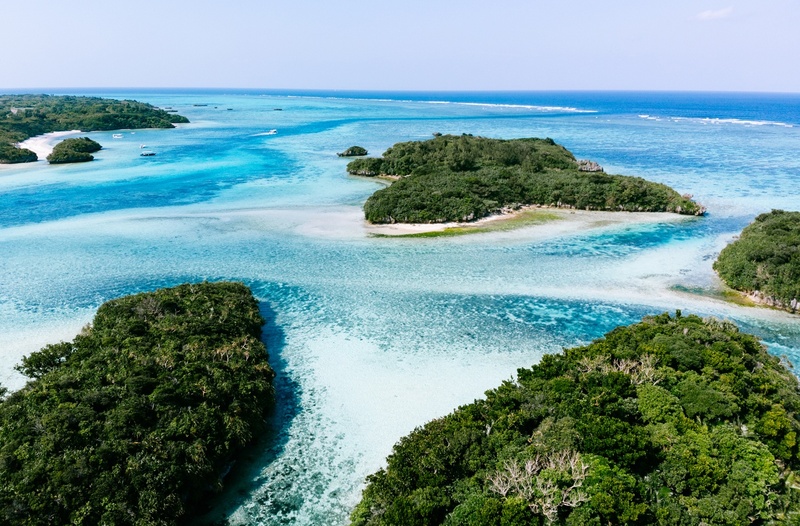 Not many people know it, but the Japanese island of Ishigaki is just 1,200 miles from Tokyo, and it’s basically the complete opposite of the country’s busy cities. With bright blue water, tropical fish swimming around, white sandy beaches, and lush rainforests, it’s truly the perfect getaway for some R&R. There are many ways to relax in Japan, but one of the most unique? Its traditional communal baths. When you’re visiting, there are plenty of different places where you can take a dip in an “onsen”—AKA a Japanese hot spring. Not only is the experience incredibly soothing, but the mineral content of the water can also do wonders for your skin. It’s a win-win all around. It should come as no surprise that matcha tastes even better when you drink it where it originates, but that’s just one of the healthy foods you’ll get to fully experience in Japan. Wakame—a type of seaweed—is another staple that’s jam-packed with health benefits you can enjoy in everything from miso soup and stir-fry to different salads. You can also go see the works of chef Takehiro Kishimoto, who creates mesmerizing art with produce—avocados, included. Then there’s the must-try flash-chilled coffee—or “aisu kohi”—that’s been beloved in Japan since the early 1900s. Sure, you can go forest bathing anywhere—but nothing beats trying it out in Japan. The practice—called shinrin-yoku—originated in the country, and helps people combat stress and improve their well-being by immersing themselves in nature. One of the best spots? Arashiyama Bamboo Grove in Kyoto, which lets you walk through a path of the otherworldly trees. If you’re in need of a restorative vacay, look no further than the minimalist Zen dens you can rent in Japan. From a relaxing spot in a quiet neighborhood in Tokyo to an Airbnb in an area surrounded by hot springs, it’s safe to say you’ll head back home feeling energized, happy, and healthier than ever—both mentally and physically. Where else in the world can you fully immerse yourself in the mindful lifestyle of Buddhist monks? One of the most sacred mountains, Koysayan, is just 90 minutes from Osaka. There you can reserve a stay that will let you eat, pray, and rest with the monks, as well as spend plenty of time exploring the area’s many temples and landmarks. Some of the best beauty products have come straight out of Japan, and visiting can help you take a deep dive into some of the country’s best beauty rituals. Think: cleansing oils, daily exfoliation practices, and ultra-hydrating essences. Marie Kondo has taught the world how to properly organize and tidy up, and Buddhist monk Shoukei Matsumoto is helping people see cleaning as a form of therapy. So many of these Japanese practices are things you do at home, so do yourself a favor and head over there to experience the lifestyle where the smart tactics originated. Cheese tea (yep, seriously!) is the newest Japanese drink taking over Instagram. Or, find out the simple, Japanese skin-care secrets that deliver a clear, glowing complexion.